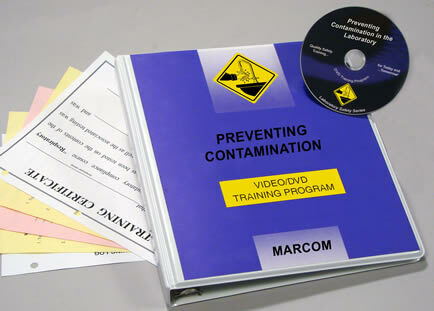 Description: MARCOM's "Preventing Contamination in the Laboratory" Videotape Training Program emphasizes the need to recognize situations that could led to contamination, and discusses what can be done to prevent contamination from occurring. Handling hazardous chemicals and specimens requires a great deal of caution. If substances are not properly controlled, hazards can spread and contaminate other materials, work area... even employees themselves. With many laboratories using toxic, corrosive and carcinogenic chemicals, employees need to do all they can to prevent contamination. Areas covered in the program include how contamination occurs, general preventative measures, engineering controls, safe work practices, personal protective equipment, and more. The Videotape Program comes with a comprehensive Leader's Guide, reproducible Scheduling & Attendance Form, Employee Quiz, Training Certificate and Training Log. This Videotape Training Program is one of 12 in the “Elements of Safety” Laboratory Safety Training Series.